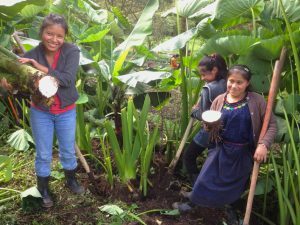 An important step in transforming Q’eqchi Maya agriculture toward sustainability might seem like a step backward. Heirloom crops are plants used historically in the diet of the Q’eqchi’ Maya people. Many of these plants were gathered not grown. Many were grown but have fallen out of common use. Today it’s a safe bet that a 70 year old great grandmother’s face will light up when you mention aracach and that her grand children will have never heard of it. Naranjilla (Solanum quitoense) is member of the nightshade family, Solanaceae. Naranjilla is related to the tomato. It is high in potassium and vitamins A and C.